Most of us can only imagine what it’s like to be the son or daughter of a revered rock star. Yes, the perks would be amazing—you get to hang backstage at concerts, meet your dad’s famous friends, and get some pretty hot dates in a heartbeat. But then imagine that you’re aspiring musician yourself. The expectations would be enormous. Never mind whatever talent you possess on your own, you’re always going to be compared to your parent. That can sink a career from the start. The genes may be passed on, but the public perception and judgemental attitudes set a high bar to start. It’s tough enough scratching out a musical career these days. Sure, you might have the benefit of family connections, but reaching the high bar your dad’s established over the past 30, 40 or 50 years is no mean feat. Here then, in honor of Father’s Day, is a list of well-known offspring who have aspired to carry on in the family tradition. It’s a varied bunch—James McCartney, Dhani Harrison, Zak Starkey, Sean Lennon and Julian Lennon—but all have that common thread of being the next generation belonging to the most influential band in the world. Each has succeeded to a degree. James McCartney is celebrating the recent release of his third album, Blackberry Train, while also attempting to defer questions about his dad whenever the subject is broached. Dhani Harrison is working on keeping his dad’s legacy alive, helped in part by the fact that he resembles his old man when he was a young mop top. Julian Lennon had some success early on, but the Lennon genes raised expectations and his star faded early on. His half brother Sean, amazingly enough, is now older than John was at the time he died, but he continues to garner good notices, both on his own and at the helm of the Plastic Ono Band, which remains the family business, Ironically, Ringo’s son Zak may be the most successful of them all, having gained regular work with Oasis, Paul Weller, the Waterboys and The Who, the latter having given him consistent gainful employment. His is a special challenge in that he follows in the footsteps of not one, but two of the most famous drummers—his dad and the inimitable Keith Moon. Good thing his old man taught him well. Miley is a rare example of a star whose light shines brighter than her father’s. Billy Ray Cyrus has his one hit, “Achy Breaky Heart,” but Miley knows how to twerk and attract controversy. That automatically allowed her to overshadow her mullet-haired dad. There’s nothing like being able to achy breaky expectations. When your old man is Glynn Johns, one of the most renowned music producers of all time, a Rock and Roll Hall of Fame inductee and the man behind the boards for some of the greatest artists in rock history (The Beatles, Bob Dylan, The Band, The Stones, Led Zeppelin, The Who, Eric Clapton and The Eagles to name a few), it’s obvious from the outset you’re going to have to establish your own individual identity. Ethan has since developed an impressive resume, with artists like the Kings of Leon, Ryan Adams, Tom Jones, Crowded House and British songstress Laura Marling filling his production resume. He’s also a gifted musician, as his performing credits alongside Emmylou Harris and Crosby Stills and Nash will attest. However, there may have been a hint of intimidation lurking in the back of his brain. He waited to record his first solo album until he was 43, which gave him plenty of time to carve out his confidence. Willie Nelson might want to thank Neil Young for giving his sons Lukas and Micha Nelson day jobs in his backing band. Not that their band hasn’t made a mark on its own, but they have given Young’s former go-to outfit Crazy Horse reason to feel as if they’ve been musically downsized and (pardon the pun), put out to pasture. Indeed, Promise of the Real is the real deal, a sizzling, straightforward band that complements Neil just fine when he’s in rock ‘n’ roll rampage mode. Check out his latest, Earth, for proof of their passion. 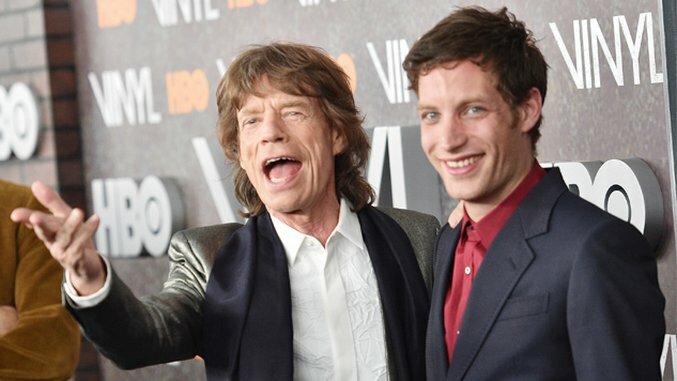 Imagine being Mick’s kid! Having to strut and posture like dear old dad does even in his 70s. Still, James benefitted from paternal favor, having secured a lead role on Vinyl, the show his dad helps oversee for HBO. He plays Kip Stevens, the pouty lead singer of Nasty Bits, a proto-punk band with a similar insurgence as The Stones. The comparisons are inevitable, but if James thinks_he_ has it tough, he’s certainly better off than his uncle Chris Jagger, whose career was consistently overshadowed by his big brother Mick. Ben can look to his aunt Kate and uncles Livingston and Alex as examples of how having the Taylor name might make it difficult to carve out an individual career. He’s gained critical recognition, but chances are, all mentions of Ben Taylor are preceded by the words “James Taylor’s kid.” The fact that he’s also the offspring of a famous mom, Carly Simon, only piles on the pressure. Richard and Linda Thompson may have had a tempestuous marriage, but they still have reason to be particularly proud of their offspring. Teddy is the better known of the two—his latest album, Little Windows, is a duo effort with singer Kelly Jones and merely the latest example of his solo success. His sister Kami has also made her mark recently at the helm of a combo called Rails, which finds her collaborating with husband James Walbourne. For a better look at the inner workings of the Thompson clan, check out their Family album, a set of songs that features contributions from each member of the Thompson clan. The best known of Bob’s offspring, Jakob sprang to superstardom at the helm of his band, The Wallflowers. The fact that the group takes its name from one of Bob’s songs is only one of several similarities they play upon. The group created a tangled tapestry that was not unlike that of The Band at Big Pink, with Jakob’s nasal vocal bringing faint reflections of the way dad sounded when he was playing along. These days Jakob is a solo star, a member of the West Coast elite and one of those artists whose every effort is eagerly anticipated. Notably, like his old man, he’s got that unmistakably cool charisma. Despite four solo albums and one with the group Low Millions, Adam has kept a fairly lower profile of late, focusing much of his energies on curating his pop’s art exhibitions. Like dad Leonard, his music tends to be somewhat dry and despondent. Presumably, that somber, sobering sound runs in the family. “Daxx, Rick’s kid, has a job. He doesn’t have to support his kid anymore and that’s a good thing. Rick’s a good father. He helps his kids out. And with his youngest one, Daxx, he’s got a good gig now. So Rick’s a happy camper.” So states Cheap Trick’s former drummer Bun E. Carlos, whose cause for discontent was being usurped from the drum throne he occupied for 40 years as Rick Nielsen’s timekeeper. Daxx does have a good gig (reason enough for forgiving his old man for dubbing him Daxx), but brother Miles is no slouch either, having formed a band of his own called Rusted Hearts. The band’s debut album, Heavy Metal is a real gem, a melodic pop masterpiece that doesn’t owe a thing to any influence from his father. Jason was barely 12 years old when his father John succumbed to such rock star excesses, but he’s still managed to carry on his dad’s legacy, not only by fronting his own tribute outfit, the Led Zeppelin Experience, but also by actually sitting in with father’s former band mates, Plant, Page and Jones, whenever they find cause to reconvene. He can also be found making an early cameo appearance in the Zep flick The Song Remains the Same while playing a scaled down drum kit under his dad’s watchful eye. His resume includes stints with Foreigner, Paul Rogers, Ted Nugent, and Joe Bonamasa, making him the go-to guy when an ace drummer with a preferred pedigree is needed.